The school has excellent sporting facilities and boasts a large number of specialist teachers and coaches in their respective sports. The specialist Physical Education staff who are based in Prep, are timetabled to work with Pre-Prep children for 90 minutes per week, ensuring pupils receive excellent specialist tuition. 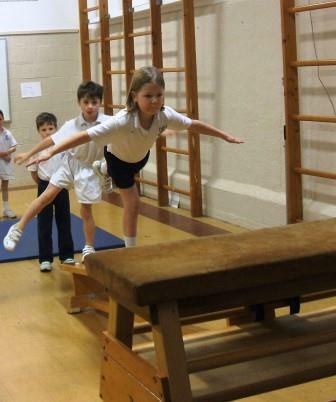 Years 1 and 2 pupils are taught basic body management skills through their Gymnastics and Dance lessons and develop ball skills, hand-eye co-ordination and team work through their weekly Games lesson. In addition to these lessons, Years 1 and 2 pupils are taught Swimming throughout the year in small ability groups. These lessons are taught by a qualifed Swimming teacher. Many children extend their participation in physical activity by attending a variety of extra-curricular activities. Curricular and Extra-Curricular sporting activities include: Athletics, Cross Country, Dance, Football, Gymnastics, Hockey, Netball, Rugby, Striking and Fielding Games, Tennis, Swimming, Martial Arts and Multi-skills.